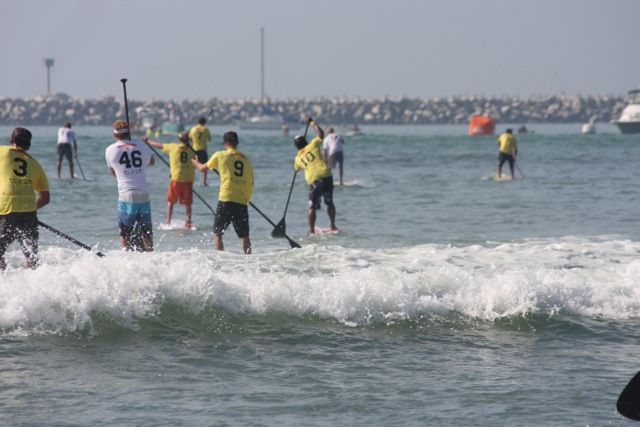 Another great event here in California at the 2010 Dana Point Rainbow Sandals Battle of the Paddle. 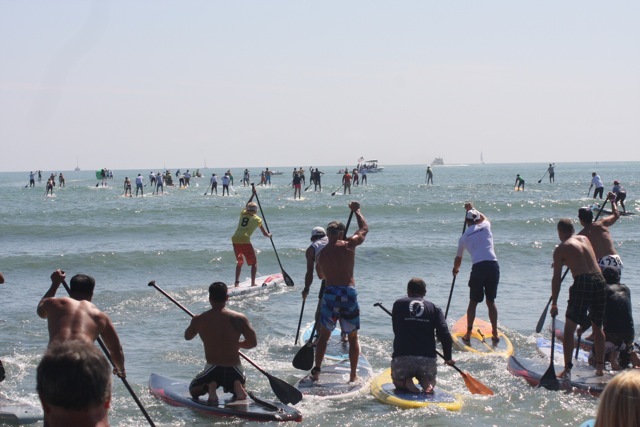 There were a total of five races involved with the Battle of the Paddle over 2 days. 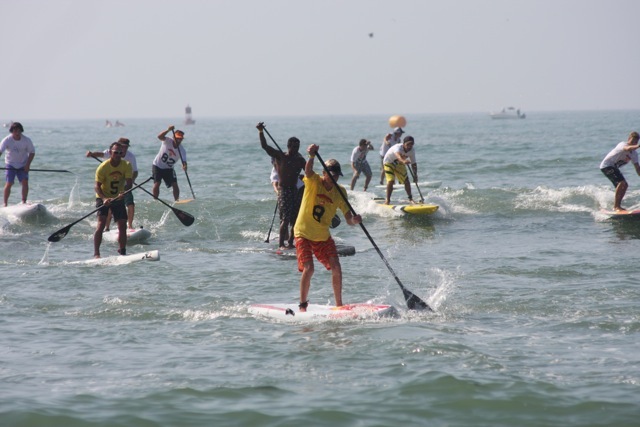 There is the main event, which is the Elite race, the Open Age group race, Distance race, Team Relay, and the Kids race. I competed in the Elite race, Open Age group, Distance race, and Team Relay. 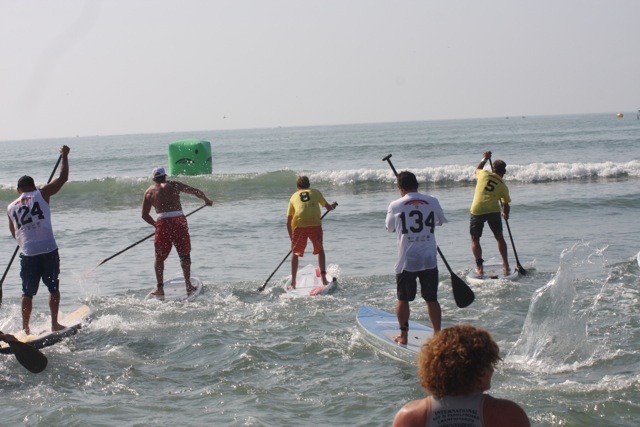 The Elite race started at 10:00am on Saturday Oct 2nd. 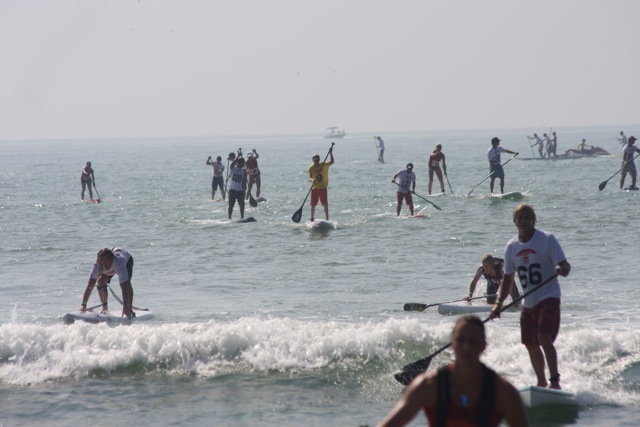 In this race there were 158 competitors. 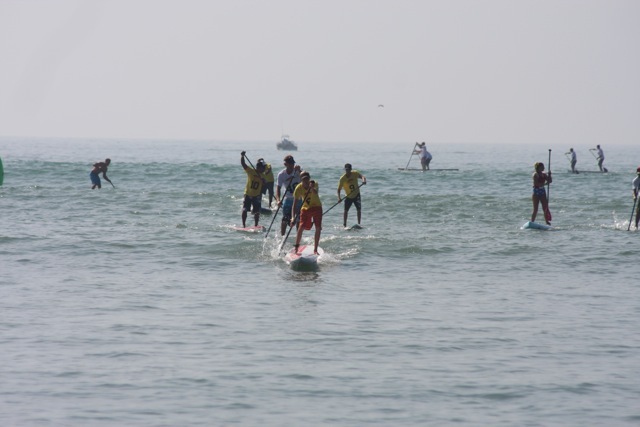 It was a beach start – so we all lined up along the shoreline – waited for the horn to blow and then we were off. 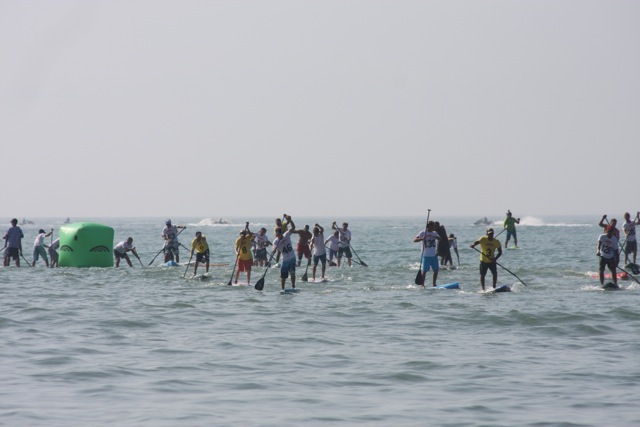 All of the 158 racers paddled out to the first buoy and I rounded in about 20th place. 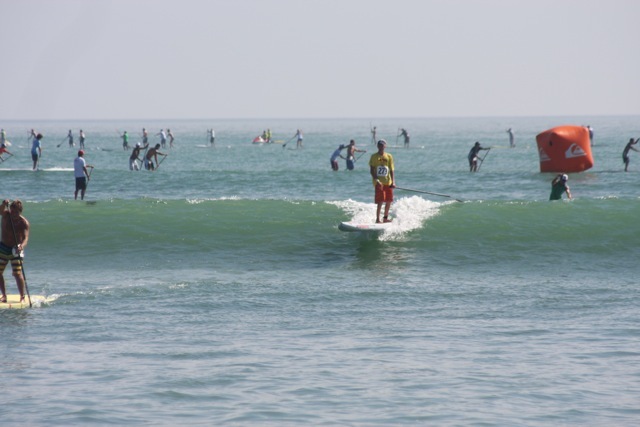 Then I headed to the 2nd buoy and I caught a wave with at least 10 people and had to round it while trying not to fall. 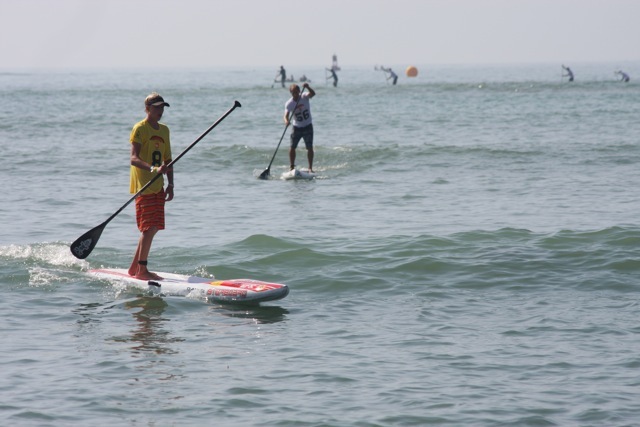 When I finally managed to round the buoy, and I headed to the outside buoy, I was now in about 10th place, because everyone ate it at that 2nd buoy. 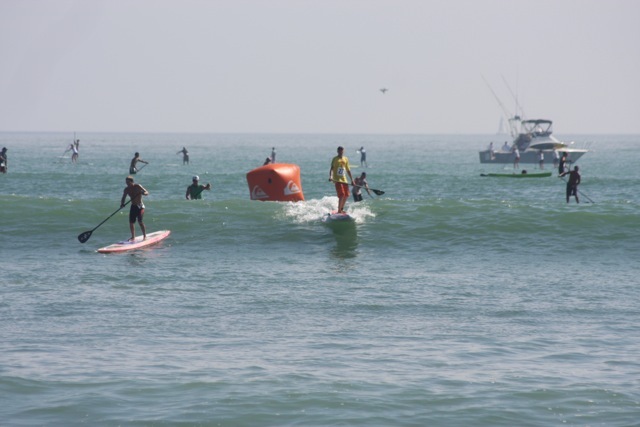 When I rounded the 3rd buoy I caught a wave to the beach for the sand run. 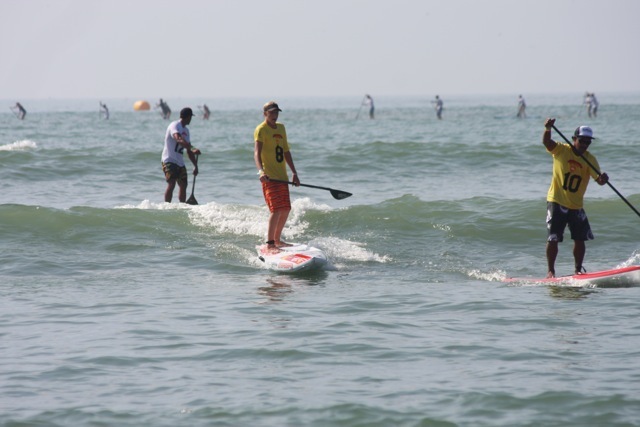 I hit the beach and sprinted like a cheetah, around the sand course, then ran down to get my board, which my board handler, Declan had perfectly positioned for me to jump on – and then I was off for my second lap. After the next lap I had passed another few people. 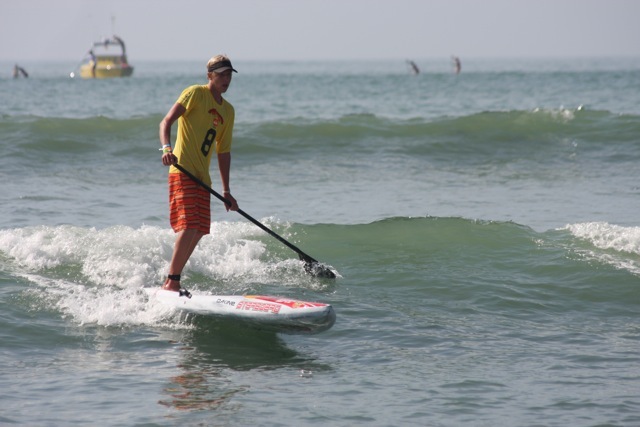 My Starboard 12′6″ Surf Race was a great performing board for these conditions. On the third lap I maintained my 6th place position. By the last lap I was slowing down but I was still in sixth. 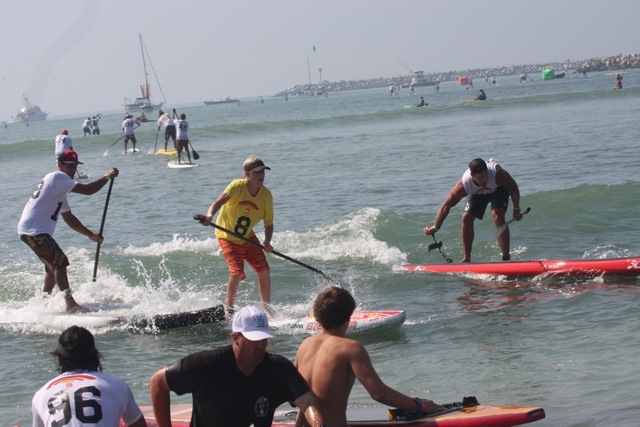 When I rounded the last buoy to come in, I caught a wave with the seventh place competitor George Cronsteadt from Tahiti. So I knew what had to be done. When I hit the beach, I ran as fast as I could and just barely beat him. My time was 1 hour 1 minute 52 seconds. 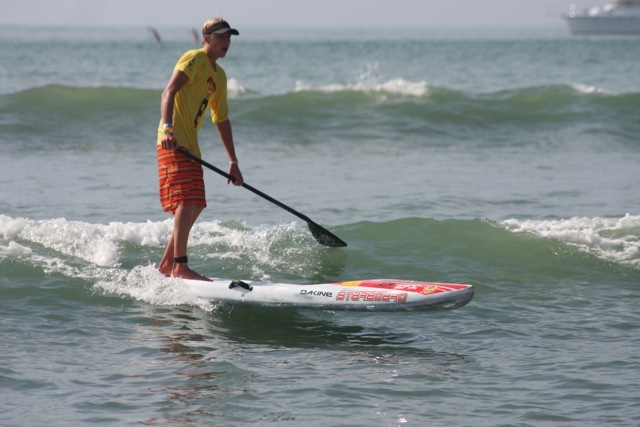 So I placed sixth overall out of 158 competitors – and was super stoked!! I was in the money and on the podium!! 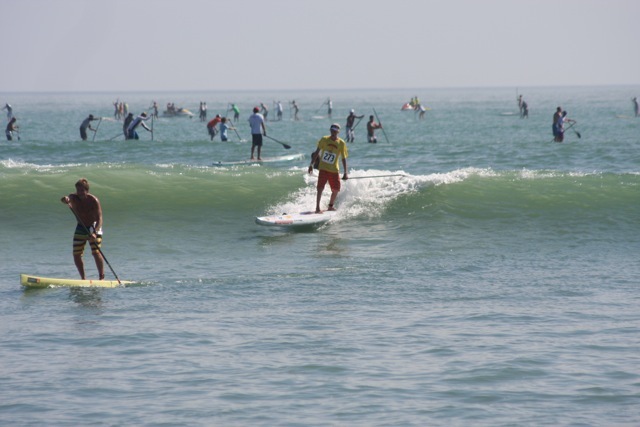 Two hours after the Elite race I lined up on the beach again for the Open Age division. 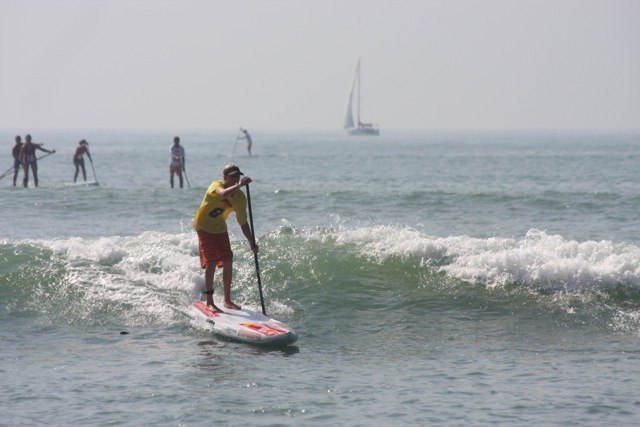 When the race started I paddled like crazy and was 2nd to round the first buoy. 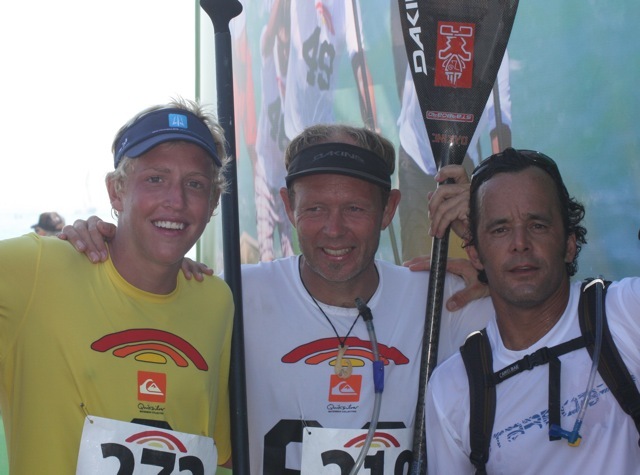 This race was all about having fun and trying not to kill myself for the Long Distance race the next day early in the morning, and the Team Relay in the afternoon. The race was five laps and was hard. I was super tired from the Elite race, so I didn’t have that much energy. 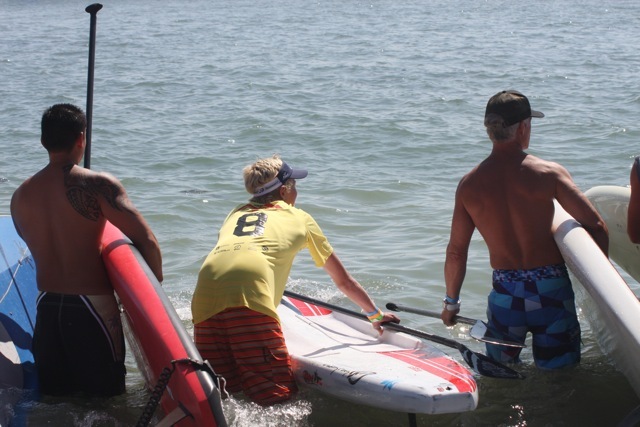 When I rounded the last buoy, I was in 2nd place behind my good friend and an unreal paddler Zane Schweitzer. I ran up the beach and almost fainted because I was so tired. 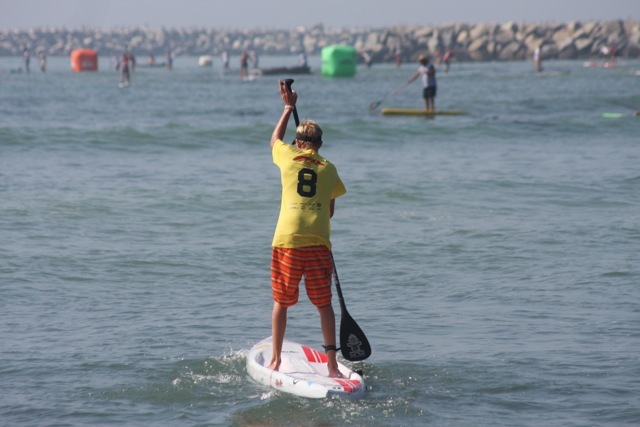 Zane and I ended up 1st and 2nd overall in the 12′6″ division, as well as in our age group. My time was 56 minutes and 59 seconds. 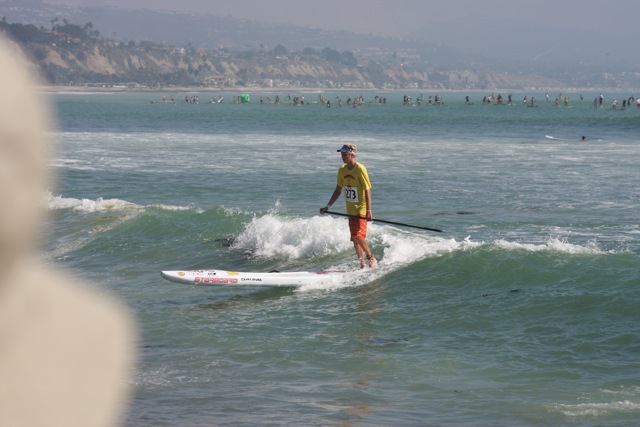 There were 341 competitors overall competing on Unlimited Boards, 14′ Boards and 12′6″ Stock Boards – and I was 14th place overall on a 12′6″ Starboard Surf Race. Very stoked with this boards performance. 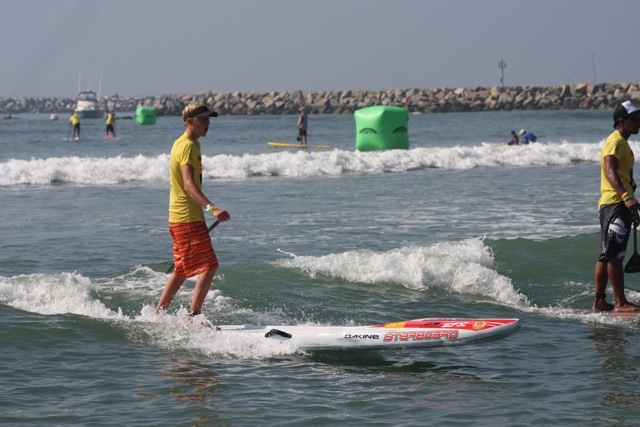 We stayed for the awards – and I was on the podium 2 times for the 2 races. It was a great ending to a fantastic day of racing. Well except for the Pasta dinner I had after – it seriously seemed like the best meal of my life. The next morning I had to wake up a little earlier, because the race started at 9:00 for the Long Distance. Normally this is my race, but out here in California it is a whole different story. 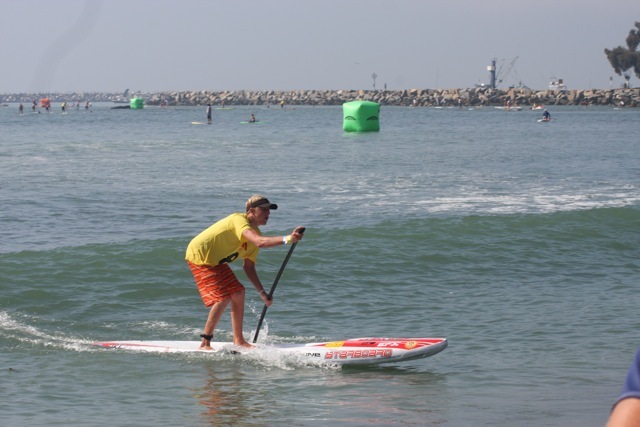 The race was 10 grueling miles of flat water. Luckily Sunday was overcast – and cooler than the day before. 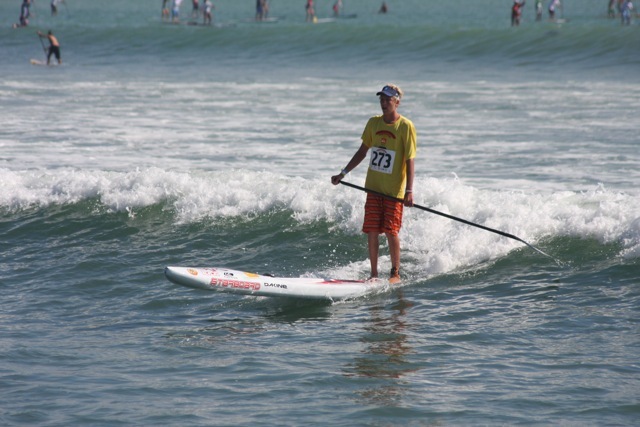 For the race I used the fourteen-foot Starboard Surf Race. 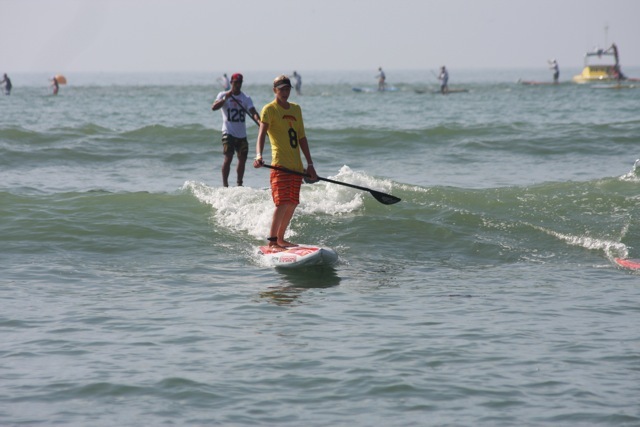 During the race it was really boring, because there were no waves, no wind swell, it was just a pure paddle. 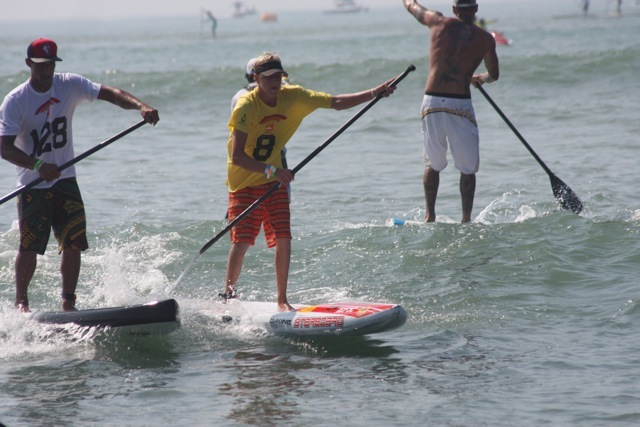 In the beginning, some of the other 14′ board competitors went behind eighteen footers and drafted. They got a 50-yard gap on Bart de Zwart and me, so the whole race Bart and I were playing catch up. 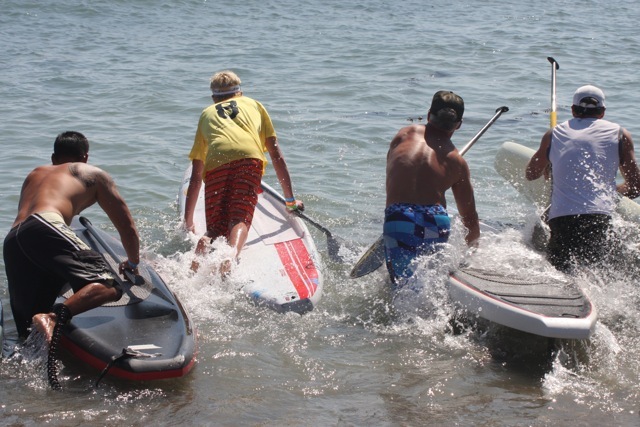 Finally at the end, I put my head down and paddled as hard as I could, which pushed Bart and the both of us kept pushing each other – sprinting as hard as we could and finally caught up to them. 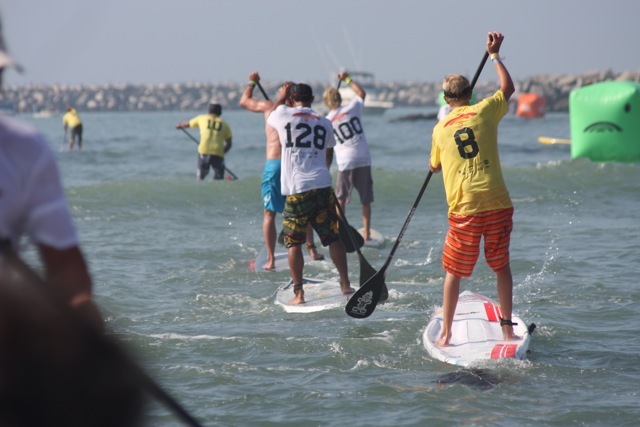 For the rest of the race the top five fourteen-footers were altogether. 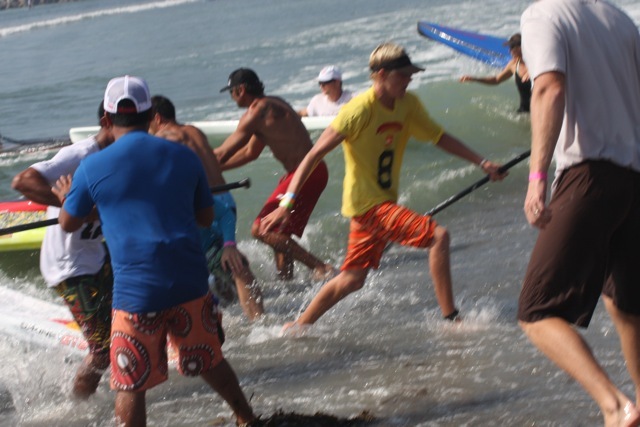 When we got close to the finish, two of the fourteen-footers pulled ahead and Slater Trout, Bart, and I were in third, fourth, and fifth. 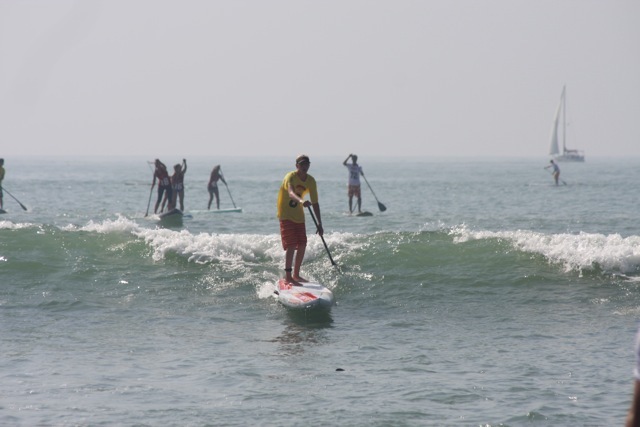 First and second caught a wave in front, and Slater, Bart, and me caught a wave together. 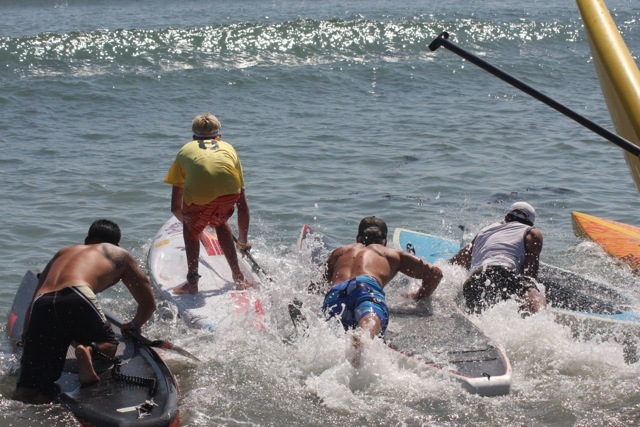 When we got close to the beach Bart lost control of his board slamming in to me and took me out. When I came in I was 5th overall in the fourteen-foot class, and 2nd in my division, finishing in a time of 1 hour 9 minutes 31 seconds. 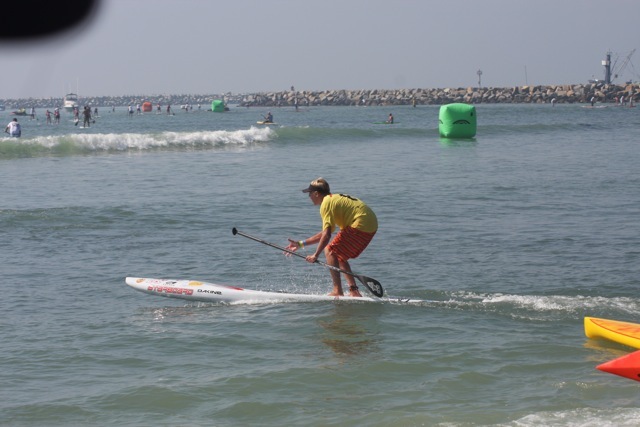 There were a total of 181 competitors in all divisions (unlimited, 14′, 12′6″) and my finish place was 15th overall. At the end of the whole contest I was super pleased with all my results and had so much fun. 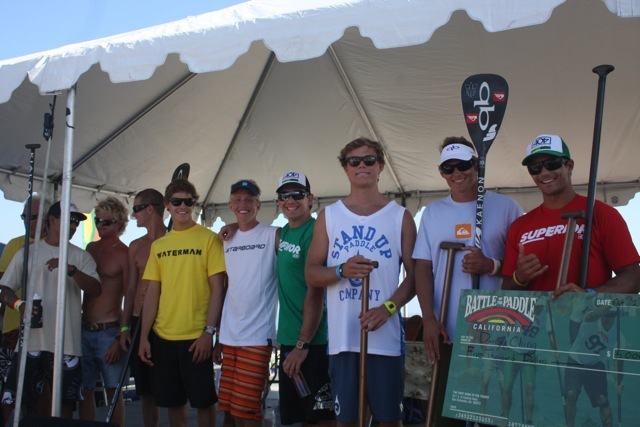 I can’t wait for the next Battle of the Paddle. 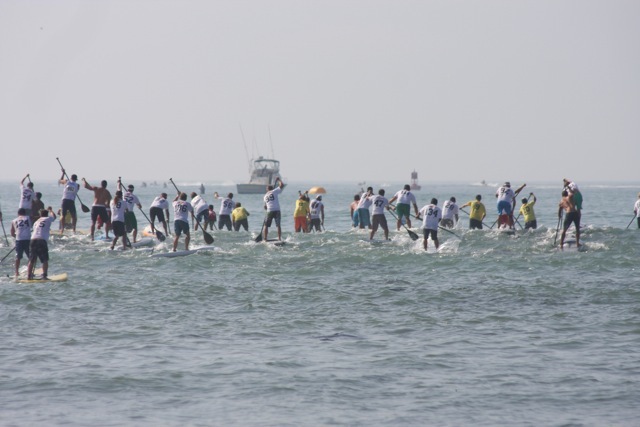 Which will be here in Hawaii next summer!!! 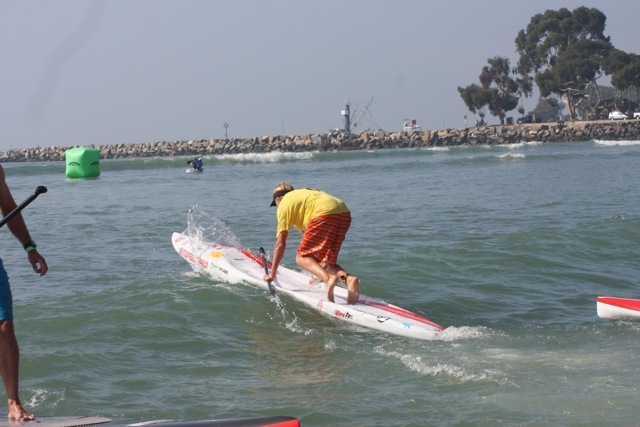 I want to thank my sponsors – Starboard, Nike 6.0, Dakine, Waterman’s Sunscreen, EFX Technology, Kaenon Sunglasses, Sunrite Maui, On It Pro, Ion Wetsuits and Hi-Tech Sports!! 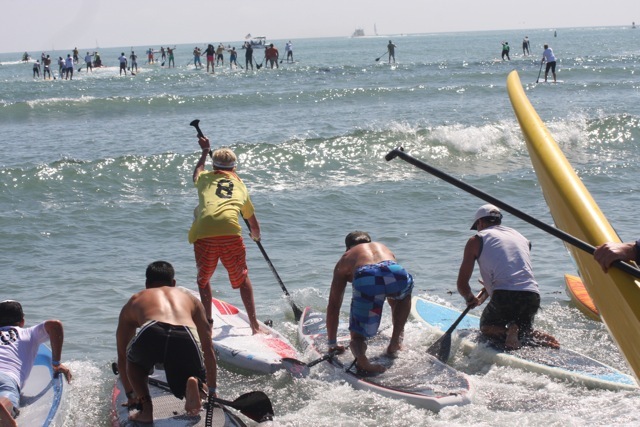 Also a big Mahalo to all the event organizers and volunteers. They put on another fantastic event!!! 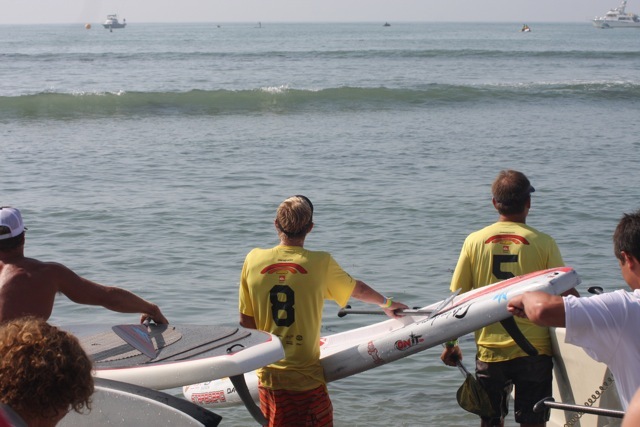 For the Elite Race the Top 10 Competitors from the Battle of the Paddle in Waikiki were issued Special Yellow Jerseys with their Placement – for their number. 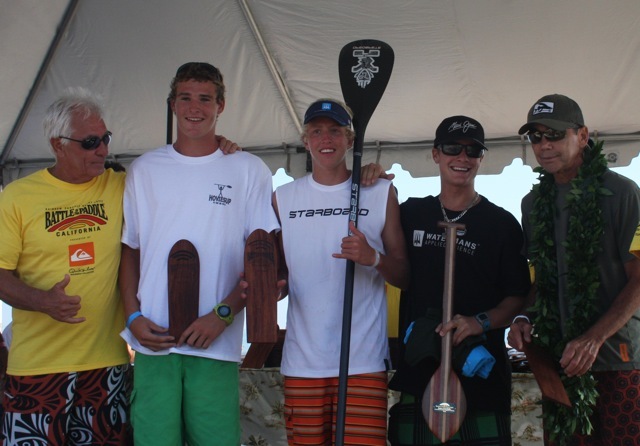 Connor placed 8th in the Hawaii Event. 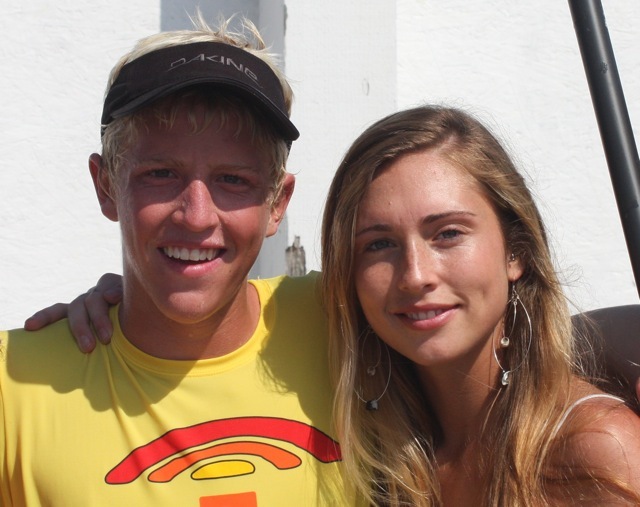 Next to him is Byron Kurt – who placed 5th. 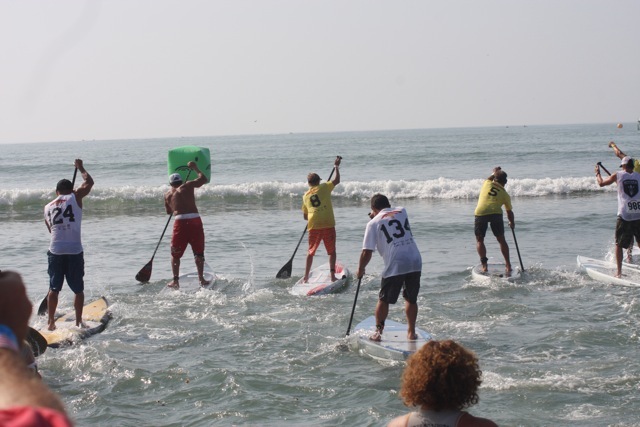 All other 150 Competitors were issued white jerseys. Award Ceremony – Connor on the podium!! !